A big Texas howdy to you! 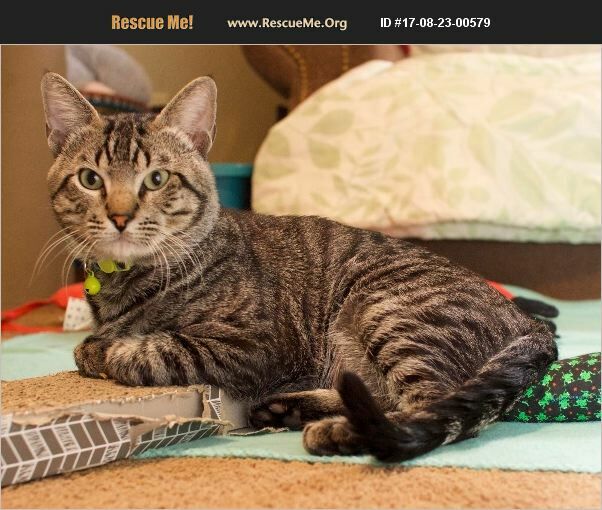 My name is Barnaby, and I'm the sweetest, most affectionate brown tabby lap cat whom you'd ever want to meet. I showed up as a stray, but the vet thinks I was born about February 2016. I love sitting next to my foster mom (or in her lap! ), getting head rubs, and even being held or carried around the house. She just loves it that nothing rattles me because I'm so relaxed and easy-going. Even getting baths, being in the cat carrier, and going to the vet fail to freak me out! Well, on second thought, I do run and hide behind the chair ONLY when the vacuum cleaner comes out and roars! You can just call me 'Mr. Congeniality' because I'm so friendly with both adults and kids. I love to greet my foster family at the door when they come home. And I'm just as curious and outgoing when strangers and visitors come! Plus I get along fine with the 3 resident female cats. My foster home has no dogs, but I bet that I would get along great with a cat-friendly canine or two. And I'm a playful dude who loves chasing the laser toy, and I'm quite attached to my stuffed elephant toy. I have perfect litter box and scratching post manners. What's not to love about me? My foster mom is puzzled how such a perfectly wonderful kitty like me ended up to be a stray. Surely no one would abandon a fantastic fella like me. However, when I showed up at my foster home, I was skinny as a rail and obviously limping from an abscessed foot. My foster mom rushed me to the vet, who healed my wound and got me all 'fixed' up. The vet's the one who broke the news of the consequences of my being a stray: I'm FIV positive, which probably happened from an altercation with another intact male. No worries! It's not a death sentence at all, and I should live a long, healthy life. Bite wounds are the only way that FIV is spread, so chances are strong that a sweet, laid-back gent like me will be no danger to other spayed/ neutered cats in a future home. Of course, I'd be a fine addition to a home without other cats or with another FIV cat. Bottom line is that I may have FIV, but I have absolutely no emotional scars from my hardscrabble beginnings. I'm curious and trusting, and I just know that I would fit in just great into YOUR home. I'm anxious to meet you, so make plans for a meet-and-greet with me today! I will quickly prove to you that I am a 'schmoozer extraordinaire!' Barnaby is updated on shots, neutered, dewormed, (will be) microchipped (upon adoption), FeLV negative, and ready for his indoor-only home. No de-clawing permitted. His adoption fee is $100, cash or check payable to Buster's Friends. Please click the contact button if you are interested in Barnaby, and we can let you know exactly where you can meet him. To make the process more efficient, download the adoption application at http://www.bustersfriends.org/catadoptionapplication.shtml. First save and then open it; then you can print it and fill it out.